Now spring has arrived snakes are starting to show their faces and as I tend work in prime snake habitats every year I couldn’t be happier (although some of my fellow workers have other thoughts on this). I have a soft spot for snakes and a lot of respect. This following blog describes some of the common species likely to be encountered in Gippsland, Victoria. 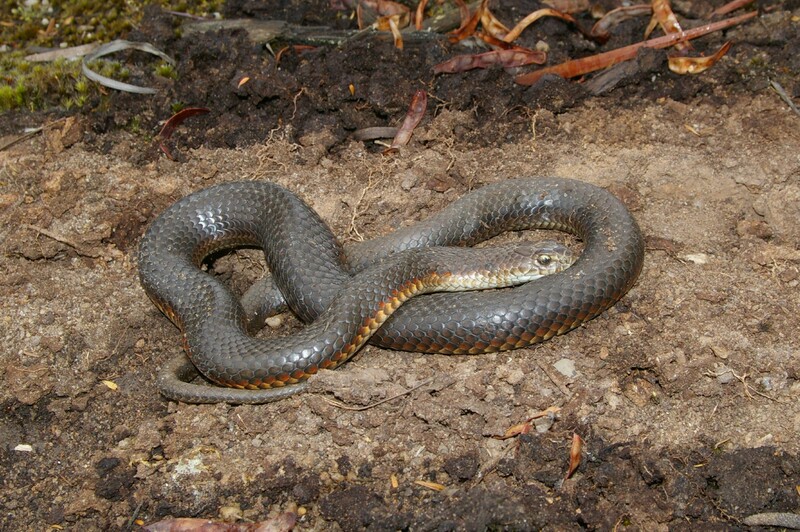 Although not as diverse as in the warmer parts of Australia, Gippsland’s snakes have evolved to withstand the bitter winters of the southern part of the continent. All species in Gippsland go through a period of semi-hibernation called torpor where they shelter under logs or in burrows during the cooler months. On warmer sunny days in winter many often emerge to feed before returning to a state of torpor in a shelter. 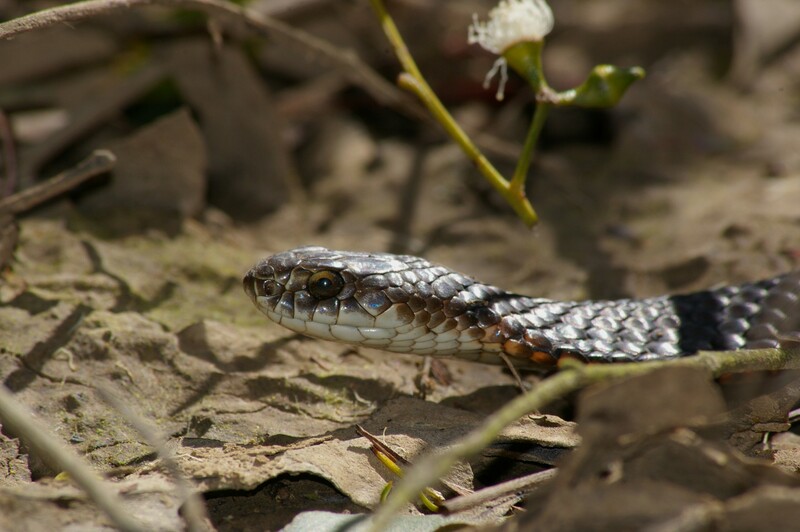 One species which has evolved to withstand at least some resilience to the cold is the White-lipped Snake Drysdalia coronoides. 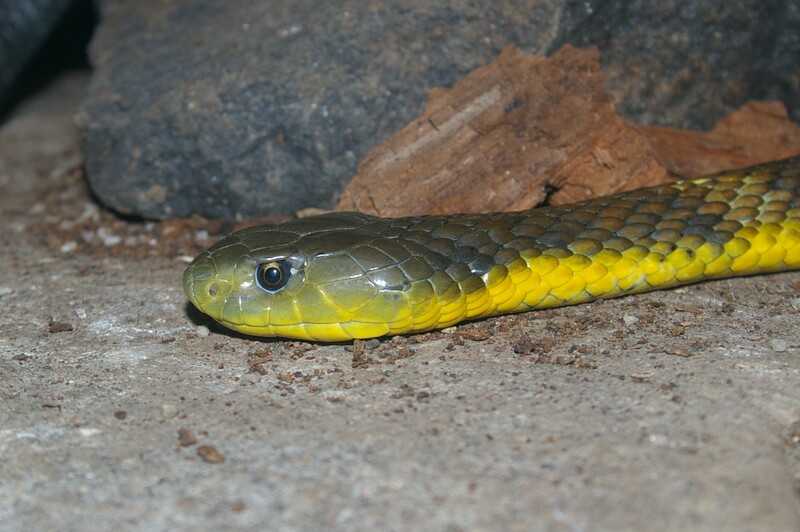 White-lipped Snake Drysdalia coronoides. Morwell River wetlands, Morwell. This small, inconspicuous species often enters torpor later than most snakes and emerges earlier at the end. It’s also found in higher elevations than other snakes in the alpine regions for the same reasons. In the reasonably mild summer of 2014/15 I saw them more frequently than usual and this could have been due to the milder conditions being favourable to them. Growing to a length of around 40cm it is generally an olive-grey or rusty brown colour with an orange to pink belly. The underside of juveniles is often much more brightly coloured as can be seen in the photos below. 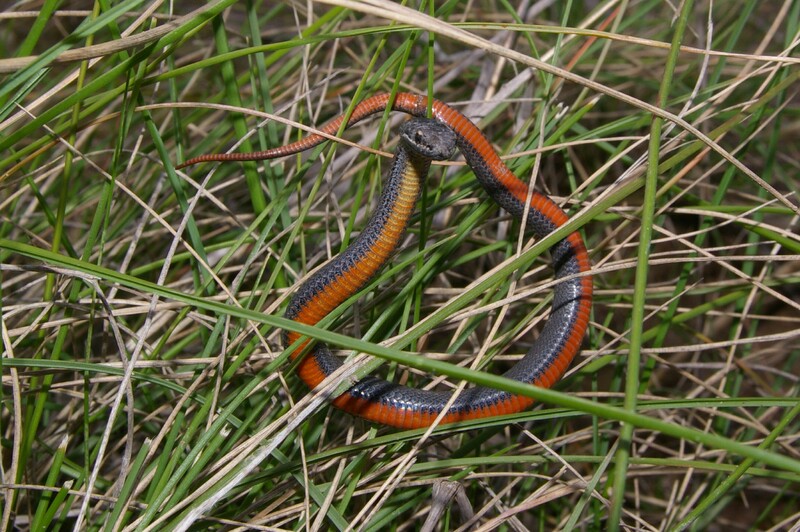 This individual was found in grass tussocks in the Latrobe Valley and was only about 25cm long. When disturbed it flashed it’s vivid belly at me and this is probably a defence mechanism of the species. Skinks are the primary food of White-lipped Snakes with some frogs and small mammals taken also. Although venomous they are generally not regarded as life-threatening to humans. They can be found in a large variety of habitats from the coast to the alpine country. 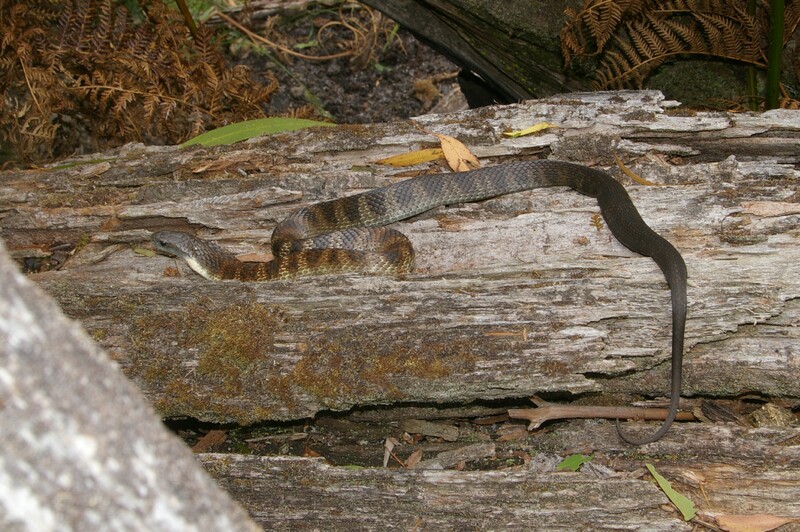 The Lowland Copperhead Austrelaps superbus is probably the most commonly encountered species in the region and as it’s name suggests it is mostly found in the lowlands or plains. It can also be found in some elevated areas. Copperheads, although being highly poisonous, are not renowned for their aggressiveness and have caused few deaths in Australia. They feed mostly on frogs and lizards and will also eat small birds and mammals. 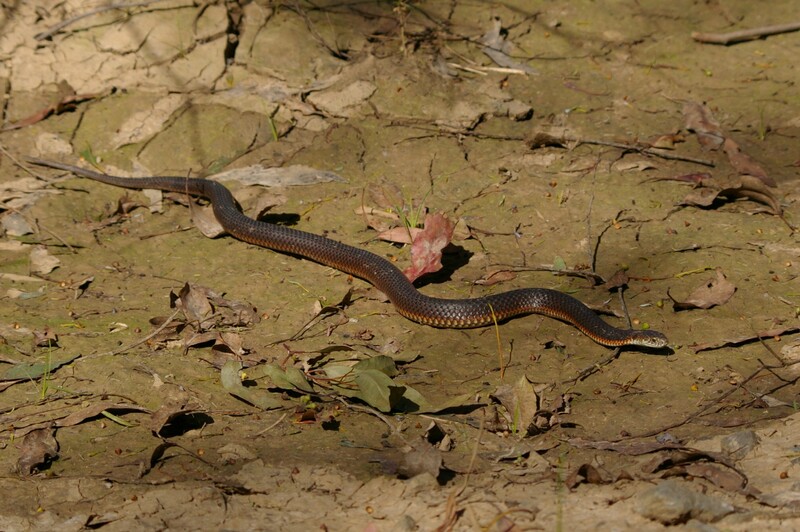 The White-lipped Snake has been recorded as prey of this species. The Lowland Copperhead can grow up to 1.7m in total length but most adults encountered are between 1 and 1.5m. The Highland Copperhead Austrelaps ramsayi is very similar to the Lowland species but differs by having more prominent white streaks on the labials (lip scales) and the head scales behind the eye are slightly different. This species can vary from brown or rusty-brown to almost black. It is found mostly in the high country and foothills and occasionally in lowland areas. 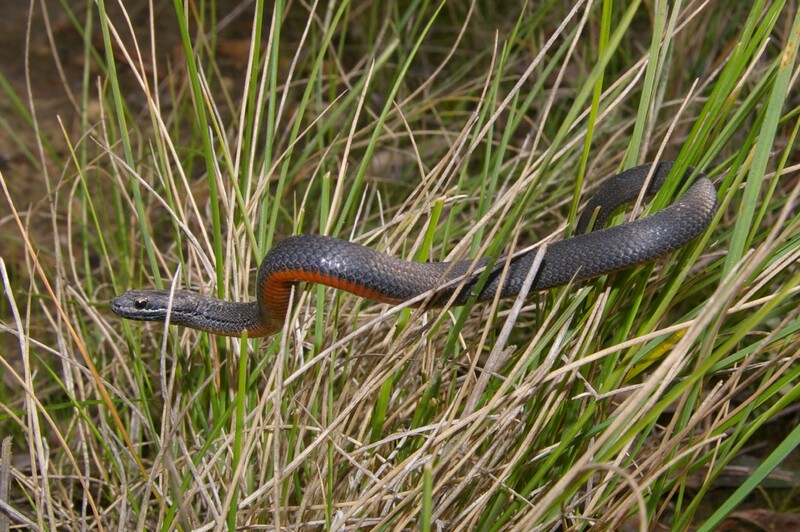 The Tiger Snake Notechis scutatus is a reasonably common species throughout Gippsland and grows to a length of 1.5m. Tiger Snake Notechis scutatus (sub-adult). Yallourn, Vic. 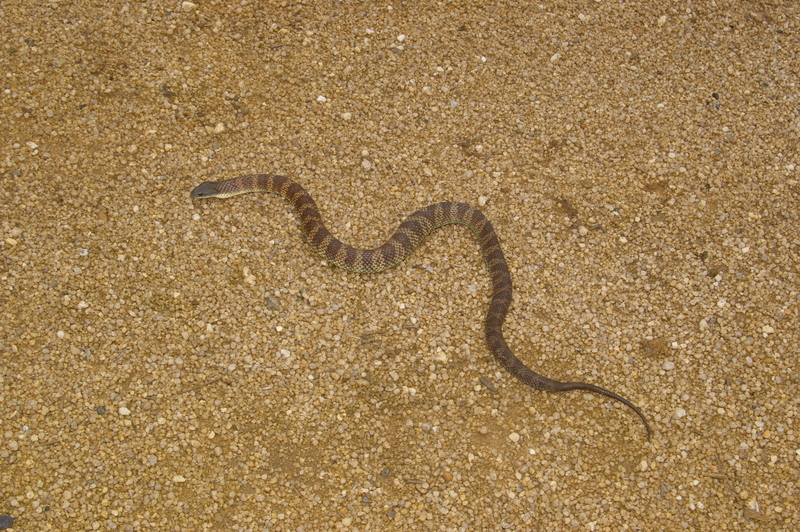 The striped markings of juveniles and adults gives the snake it’s common name. Due to their taste for frogs they are often found near swamps and other wetlands and are capable of swimming and climbing very well. 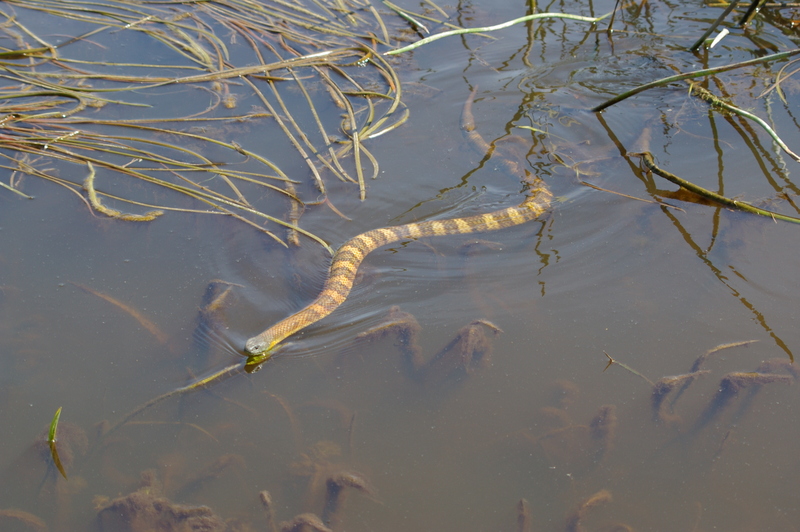 Tiger Snakes are very good swimmers. 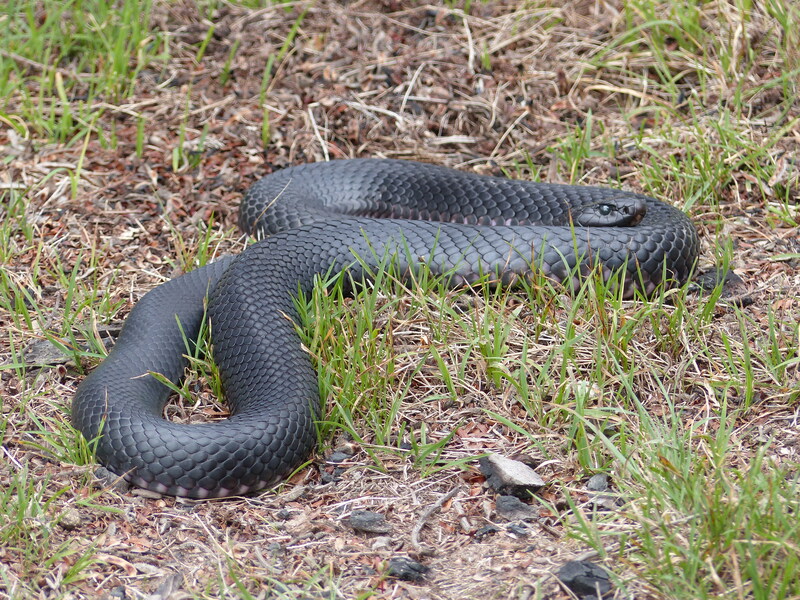 Beside a frog-filled swamp I have seen a Black Rock Skink Egernia saxatilis moving about on a log within two metres of a basking Tiger Snake, seemingly aware that the snake posed it little threat and possibly using the snake for protection from predators. They will occasionally eat lizards, as well as small mammals and birds, so the skink was living dangerously! Tiger Snakes are one of the most dangerous snakes in the world due to their aggressive nature if provoked and the high toxicity of their venom. 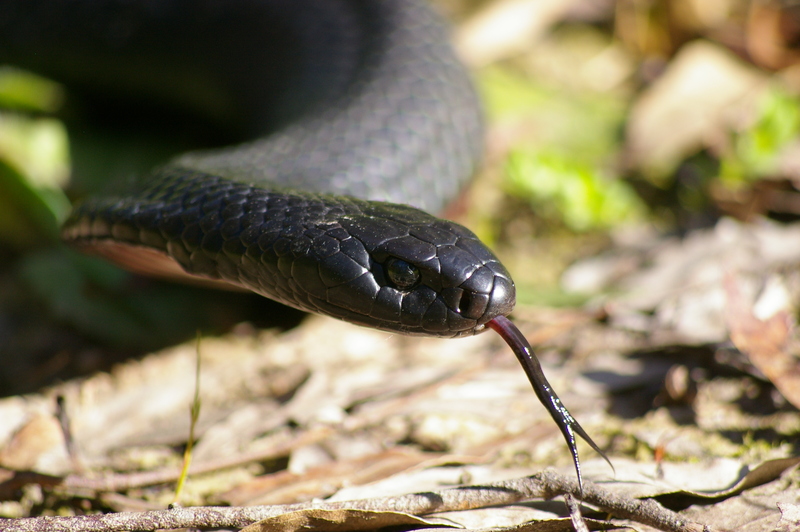 Most human deaths from Tiger Snake bites occurred in the 1800’s and early 1900’s, probably due to the draining of wetlands for agriculture and housing which forced the snakes to become more mobile. They were possibly much more common and widespread than they are now. 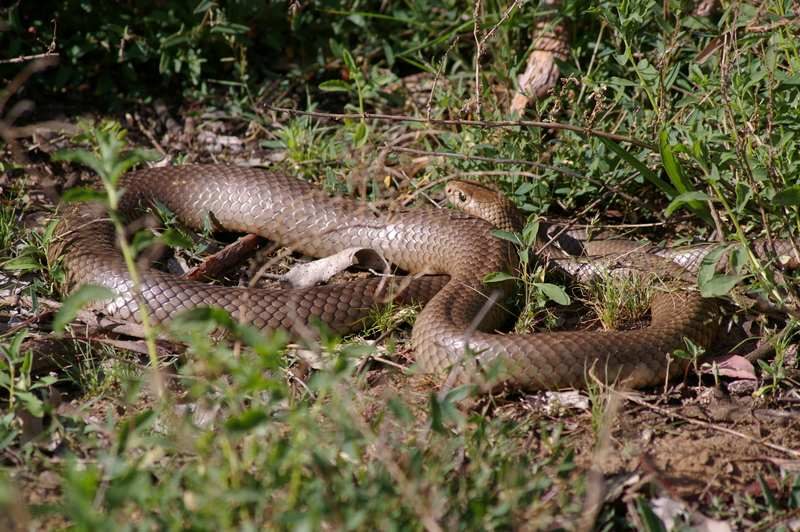 The majority of deaths in Australia since the mid 1900’s have been primarily due to the Eastern Brown Snake Pseudonaja textilis (see below) and the Western Brown or Gwarder Pseudonaja nuchalis. 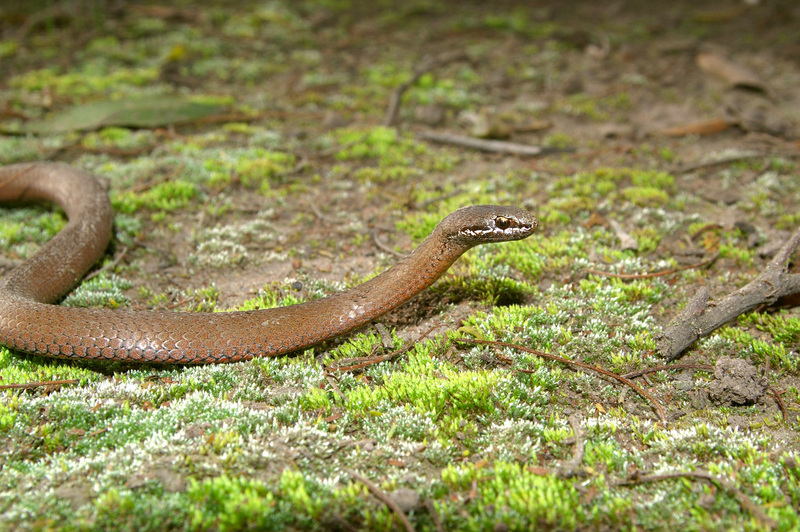 The Eastern Brown Snake Pseudonaja textilis is a large species growing over 2m in length and is found throughout Gippsland but is more common in the drier parts. Eastern Browns are responsible for a large proportion of human deaths in Australia due to their aggressive nature and toxic venom. While hiking I have stumbled accidentally across a pair of mating Eastern Browns and as a result the male has flung itself at me very aggressively. They feed on a wide range of vertebrates, particularly reptiles and small mammals. 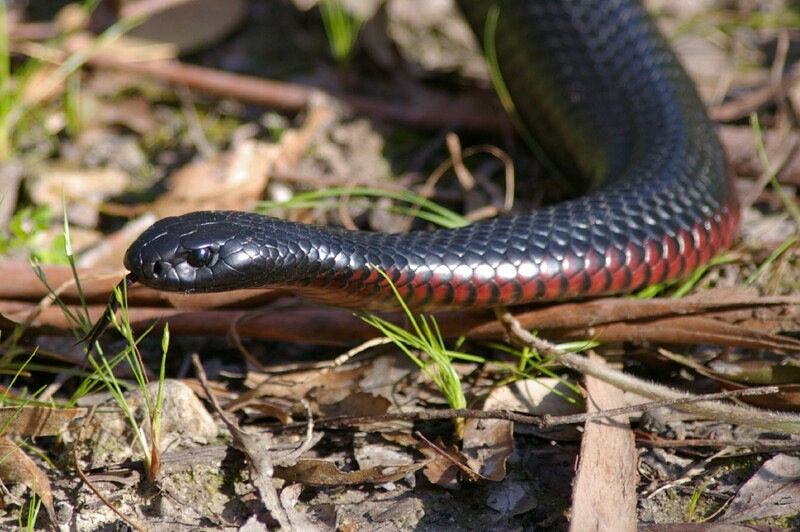 The Red-bellied Black Snake Pseudechis porphyriacus is found throughout Gippsland in a wide variety of habitats from the high country to coastal areas. They can grow up to 2m but most individual seen are usually around 1.5m. The belly can be vivid red or pale pink-red depending on the region and individual. Their diet consists mostly of reptiles and frogs but will take other vertebrates. Categories: gippsland, reptiles, snakes, victoria | Tags: copperhead, eastern brown snake, gippsland, red bellied black snake, reptiles, snakes, tiger snake, victoria, white-lipped snake | Permalink.